What a great episode. I’m not sure if it’s simply great casting – which this season does feature – or a combination of casting and editing, but this episode so clearly worked. I loved every second of it, from the beginning right to Wendell’s amazing message to Chris. And to celebrate such a killer episode, we need some good ol’ theory. So let’s talk some self-efficacy, a classic concept/theory in social psychology. While we all probably loved Chris getting the boot this episode, I’m guessing we can all agree it was a bad move, right? During the episode, many noted how Chris wouldn’t lie and is totally predictable. We also know most people couldn’t stand him and there was no way he would win in front of a jury. So why boot him and not try to eliminate Dom or Wendell? Well, isn’t this a typical merge episode? Think about it, at the merge, we often see easy targets get the boot. These are people that probably shouldn’t go home, but just make for an easy vote that everyone can get behind. And that’s the key: Everyone can get behind these votes. At the merge, I’m guessing it’s a really anxious time for castaways. They’ve made it to a pivotal moment and the entire game is changing in front of them. They’re all nervous and want to make sure their game continues. They all know if they can last just a little longer, they can probably find their footing. And they all know the merge vote usually reveals a lot of information. That’s the key with self-efficacy. You’ve all probably seen me mention the name Albert Bandura before. Bandura is the hugely influential scholar who introduced social learning theory to the field. He’s the one who did all those seminal studies of children watching videos of Bobo dolls. With self-efficacy, Bandura argues that someone’s behavior is influenced by their perceived ability to accomplish a desired result. So what does that mean? It essentially means that the more confident we are we can accomplish a specific goal, the more likely we are to engage in the behaviors needed to accomplish the goal. If we’re not confident at all, we’re far less likely to try something. And, of course, there are many factors that influence our confidence. Looking at this week’s episode, people were probably far more confident that everyone could come together and eliminate Chris. They all knew, individually, that if they took a run at Dom or Wendell, they might not get it done, which could have horrible repercussions on alliances, etc. And we know that anxiousness and uncertainty really influence confidence. 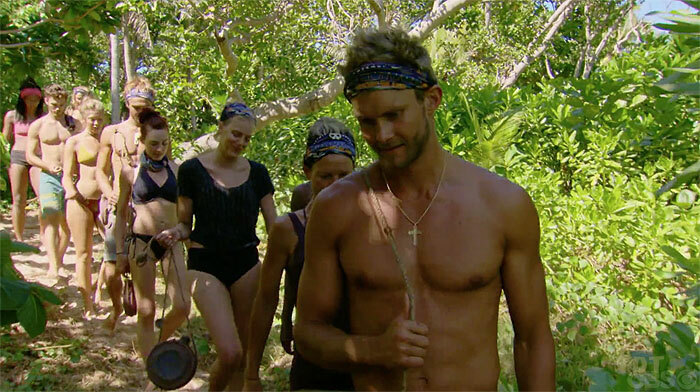 Basically, the remaining castaways did not have enough self-efficacy to chance eliminating a bigger threat than Chris. This was easy. Everyone could get behind it. Everyone had the confidence to know it would happen. At the merge, all these insecurities probably eat away at confidence and that’s why we see such obvious boots. Make sense? Jenna: It’s probably not a good sign if, in the merge episode, you’re barely shown. And when you’re shown, it’s really because of Libby and you’re certainly not depicted in a positive manner. Angela: Honestly, I was surprised when Angela was included in the group of four women thinking about voting out Libby. Maybe we’ve all been underestimating Angela? I still don’t think so. She’s very obviously the lowest on that totem pole; she’s got three episodes left in her, max. Sebastian: While I know there is no way in hell SeaBass wins this game, I’m still wondering how it is that he gets the boot. 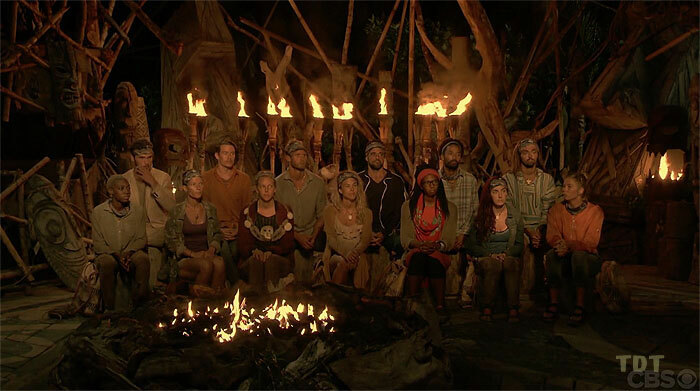 With many of the castaways, you can kind of figure out the two or three scenarios that will play out before their elimination. With SeaBass, not so much. I do think he’s gone soon, but does it come from people actually targeting him or does he become simply a number in a minority alliance? Either way, I hope he finds some lovely, um, herbs at Ponderosa. Chelsea: Each and every week recently, Chelsea makes a case for being an actual player in this game. But, you know, each and every week, I dismiss those signs and continue to believe she’s a follower or goat come the end game. Donathan: Donathan sure played everything this week really well. I was super impressed the way he listened to Chris and then meandered on over to spoil the plan to Domenick and Wendell. He did a great job. Now, did he make the right move? I’m not sure about that. Libby: Poor Libby looked bad this week. I mean, not as bad as Chris, of course, but bad nonetheless. All those confessionals of her talking about what a good position she’s in? Sure didn’t look good. The real question now is whether Libby acknowledges people might think of her as a threat. If she does, she needs to start acting like a threat. She can’t sit back and let others dictate the game anymore. Desiree: I’m not really sure what to think about Desiree’s focus on Libby. In the end, though, I don’t think it can be a good thing. Libby is clearly in the minority and not exactly Huge Threat #1 in this game. Why bother with her too much? Domenick: Great use of the Legacy Advantage. Obviously good use of the social connections he’s made; heck, Chris is an obvious bad player and yet Domenick made people vote for Chris instead of himself. That’s good playing. The previews make it look like folks are starting to notice Domenick and Wendell having too much power. We shall see. Michael: Somehow, some way, Michael actually found himself in the position Libby thought she was in. When it came time to vote someone off, barely anyone even mentioned Michael. And the one time he was mentioned? People dismissed him as a big target that could be gotten at any point. Not good. Laurel: My Winner Pick™ still looks to be in a good spot. Honestly, I don’t want to jinx anything, but we’re past the merge and the person I picked to win is still around? That’s kind of amazing. And unlikely. And weird. And awesome. Kellyn: I can’t help but think producers not only showed us Kellyn leading that conversation about potentially eliminating Libby as a red herring, but also to remind us how much sway and power Kellyn owns in this game. Wendell: Even if people do start to target Domenick and Wendell, or at least start acknowledging how much power the pair owns, they’re going to focus on Domenick first. And Wendell, I think, seems to have made more connections with everyone. In short, I think Wendell remains in an awesome spot. OK, well, let’s call it a day. Here’s to hoping for another great episode this week.